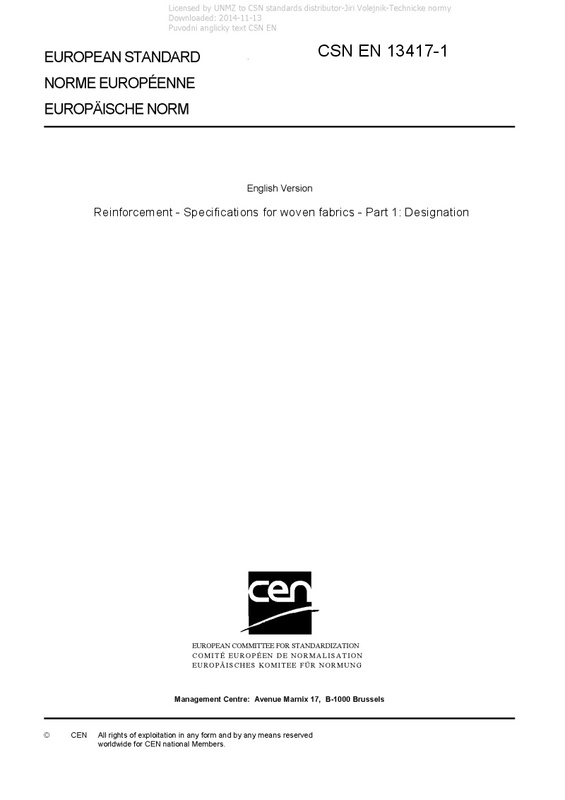 EN 13417-1 Reinforcement - Specifications for woven fabrics - Part 1: Designation - 1.1 This Part 1 of EN 13417 establishes a method of designation for woven fabrics which may be used as a basis for specifications of fabrics used for the reinforcement of plastics. 1.2 This designation system applies to fabrics made from para-aramid, carbon, glass, polyethylene, polyester and ceramic fibre in the form of single yarns, plied yarns, cabled yarns, textured yarns, rovings, tows, etc. and which are intended to provide reinforcement in plastic composite materials. The material used may be used on its own or in combination (hybrids). 1.3 The designation of a fabric is structured in a product hierarchy which includes several levels which determine families and sub-families of fabrics. It is not intended that this hierarchy takes into account all the attributes of individual fabrics which may use different yarn types or different yarn counts. Neither is it intended to imply that woven fabrics having the same designation give necessarily the same performance. This Part 1 of EN 13417 does not give engineering data, performance data or data which may be required to specify woven fabrics for a particular application or method of processing. If such additional properties are required they shall be determined in accordance with the test methods specified in EN 13417-2.